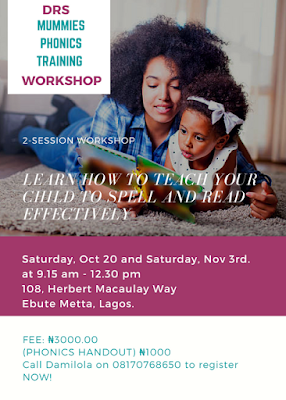 Learn how to teach your child to spell and read effectively. Find out how English words are constructed and pronounced correctly and learn multiple techniques for practicing phonics at home with your child in a fun and memorable way. This workshop has been designed to help mothers, relatives or caregivers understand what their children are doing in class and provide them with practical information and ways to support their child's learning... It is also relevant for mothers who are interested in phonics for their own personal learning and development. In Module 1, you will be looking at: what phonics is and how phonics helps your child learn reading and spelling the four key skills of saying and recognizing all the 42 speech sounds, blending, segmenting and letter formation helping your children to practice pre-writing and writing skills the International Phonetic Alphabet so that you can extend your own pronunciation skills. In Module 2, you will be looking at: initial and ending consonant blends and blending two-syllable words how to help your child identify, read and spell tricky words, and recognize alternative spellings some common irregularities in English spelling. Registering is ongoing. Call Damilola on 08170768650 to register NOW.